A party to celebrate 50th and a 21st birthdays in one, with a summer festival feel. Around 200 people came many camping in luxurious tepees. 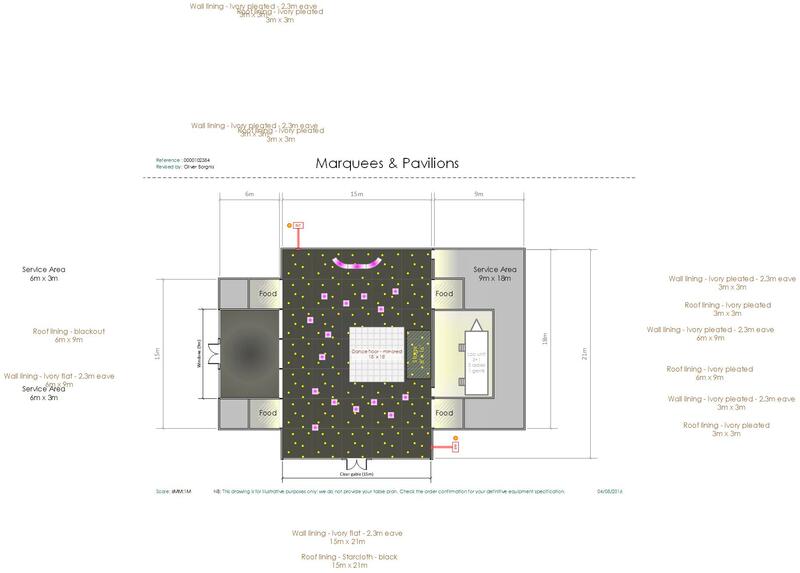 The marquee would be used for dancing, two bars and a separate lounge area, and also a variety of food stalls. 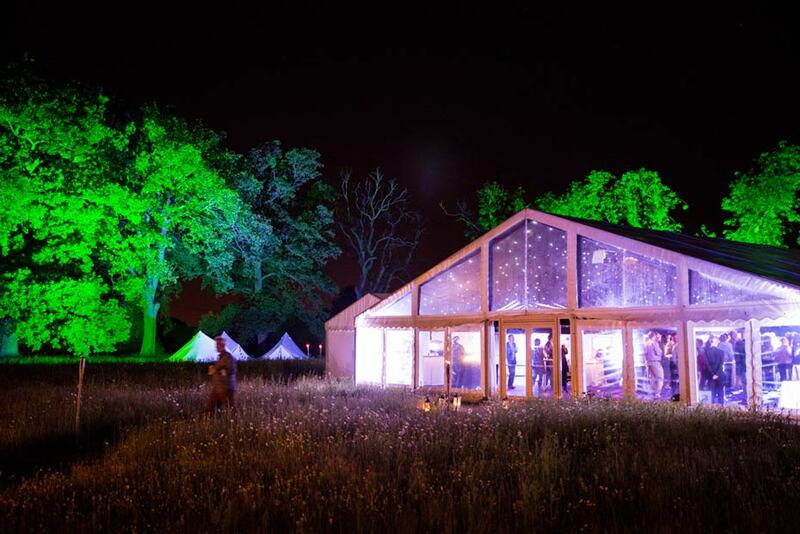 The whole event happened in a field adjoining the clients house. There were additional marquees for catering and food service and for the built in mobile toilets. The marquee included heating. The generator and electrical distribution was handled by the production company. The interior finish was intended to give a pop-up nightclub feel and be suitable for both a 50th and a 21st. A large main space was dressed with blackout linings and a star cloth ceiling. This would house the stage and dance floor and plenty of seating scattered around. Food stations were placed in small adjoining marquees so that they could be screened off when not in use. 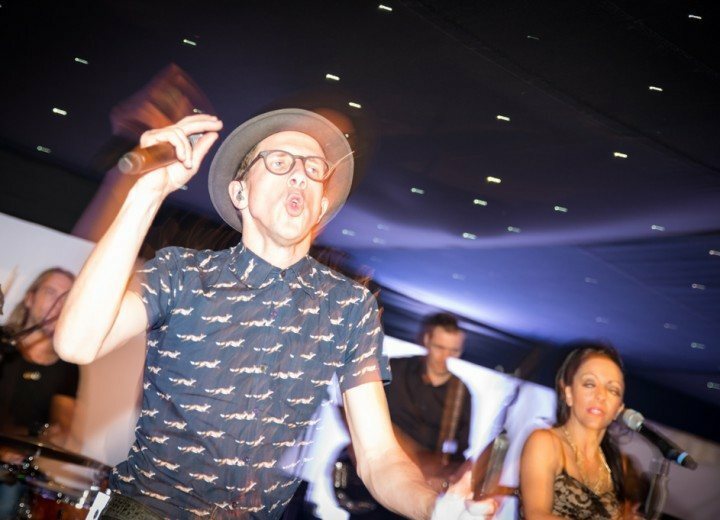 There were bars in the main marquee and in a separate chill-out lounge. 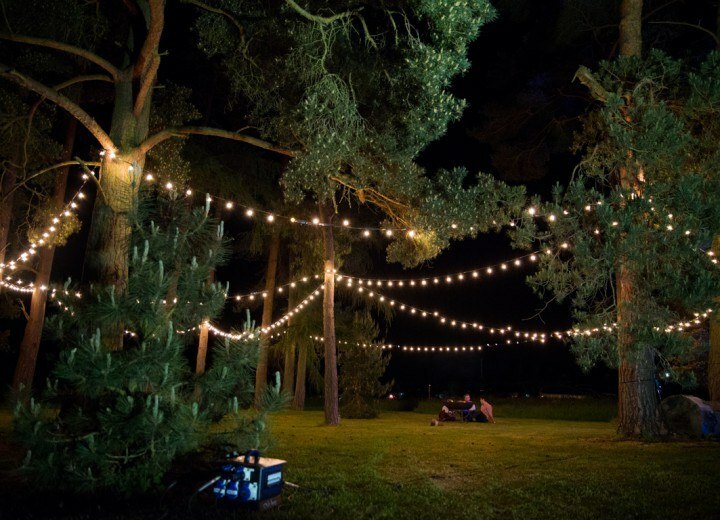 The marquee was installed with a clear gable end and was positioned to face a copse of large trees which were decoratively lit. We pre-delivered a lot of the materials and where then able to build most of the marquee in a day. Siting the mobile loos and finishing the cloak room around them meant a small crew returned the following day. Because the structures were in the middle of a flower meadow we had to be careful to work in a confined space and not create a trampled area around the site. This made vehicle access, in particular siting the loos, a particular challenge on this site. The event was managed by Mask Events who also organised the various caterers and entertainment acts. We supplied the structures, flooring, linings and carpet as well as the loos and heating. The stage, dance floor and furniture were supplier and installed by Pulse Productions who work alongside Mask on their events.